In this painting Jan Steen depicts one of his rare biblical scenes. He shows the prophet Moses during the journey of the nation of Israel through the desert to Canaan. When the people grumbled because of thirst, Moses miraculously produced water from a stone, following God's command. However, he struck the rock twice, betraying doubt, and God punished him by denying him entry to the Promised Land. Jan Steen, beloved painter of earthy and comic domestic scenes, also painted a few subjects with serious moralizing messages drawn from the Bible. Yet even when addressing such elevated themes, Steen used his keen observation of human nature and foibles to enliven his rather untraditional renditions. For instances, in this representation of Moses striking water from the rock, as told in the Book of Exodus, Steen draws attention away from Moses and the miracle itself to the moment after the water has come forth. Reminding us that thirst afflicts rich and poor alike, he shows an elegantly attired woman on the right drinking out of an exotic cup made from a shell, while the humble couple at the left offer water to their child before partaking of it themselves. 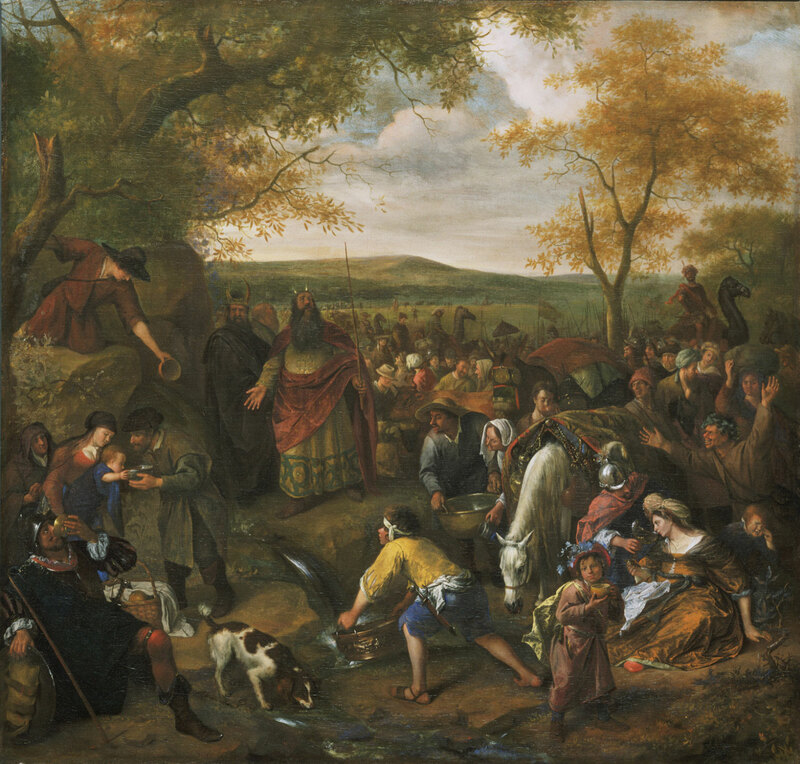 In this painting, one of ten by Steen in the Museum, he has utilized his skills at depicting a rich variety of characters to enliven the moral message of the Old Testament event. Katherine Crawford Luber, from Philadelphia Museum of Art: Handbook of the Collections (1995), p. 178.